WordPress platform is gaining popularity daily. That’s why thoughts about getting together in order to discuss the most demanding problems has been running in Kharkov WP developer’s head for a while. NIX Solutions finally brought the idea into life in the end of winter. WordPress Meetup #1 took place in a comfortable conference room of Metalist Sports Complex. The attendees listened to informative reports of experts, participated in spirited debates on professional topics and had a good time socializing and drinking coffee with sweets during the breaks. Evgeniy Kotelnitsky opened the meeting with the report titled “How WordPress Works”. He was speaking about points of access, routing, hook system, data models, basic abstractions and other notions and tools. Dmitry Kuzovlev in his report “Theme Layout in a few words” gave answers to many burning questions: What comprises the theme? What is a point of child theme? What does template hierarchy mean? CSS & JS linking cobwebs – what are they? Where you should never apply functions.php? Nikita Yurov’s detailed report on “Google Analytics + WordPress” completed the meeting. Nikita shared some valuable information on tracking code, plug-ins, tracking events, etc. 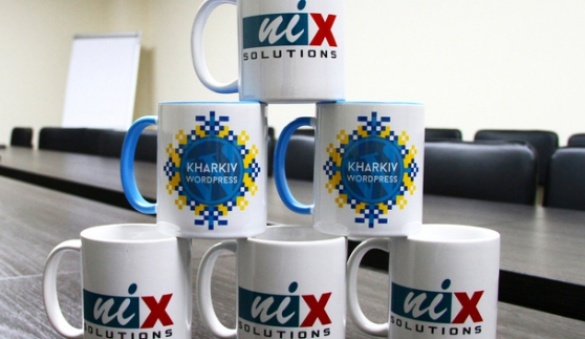 In conclusion NIX Solutions bestowed 7 best speakers with special WordPress cups. Those who asked the most interesting questions (from the sponsor’s point of view) received annual PhpStorm licenses from JetBrains.